Sorry guys, I do not have as much time today for research. But I was able to update a few of the Confederate Ironclads. There is a lot of conflicting data on the CSS Atlanta’s armaments so please leave a comment if you have a source of data that is different than what we have. Enjoy the weather out there! Since there will be no activity until this Sunday I decided I would post a fun fact of ACW Naval as well as some ships that had some updates made today thanks to some readers. On December 12, 1862 the 512-ton Union ironclad Cairo succumbed to a mine while in the Yazoo River. So, while at Cold Wars I made my first purchases in this hobby (not counting the money spent to build the table “Big Blue”. I identified Trent’s Reach as the first battle I will build for and GM. With that in mind I made the following purchases. In addition to two batteries. They will be Battery Dantzler and Battery Parsons. Pilings and Obstructions and some items that were thrown in such as an Armed tug and several 1 gun positions. Next comes the painting. If you have any knowledge about specifics as far as painting these ships please let me know! Next purchases will be coastline, snow, docks, houses, very very small trees. This weekend will be time to lacquer “Big Blue”. If anyone has done this please let me know the quickest way to do this. I am reading a spray lacquer is the way to go. What a great weekend. Although it was not as well attended as I had hoped, there were many empty tables all throughout the day, the games and the people that were there were fantastic. Quickly to Captain Taco’s awards! Best Terrain: Phil Viverito in Alesia – Freedom or Death! 52 B.C. Best beer: PBR Pounders. Kept me happy. Best meal: Cici’s pizza buffet. Kicking off Cold Wars was a battle between the Russians and Romanians. Playing the Russians in a defensive battle we won an overwhelming victory and changed history! Afterwards, I was a part of an airborne attack on a British aircraft carrier at Malta. Due to a confusion of the rules our air squadrons were shot out of the sky like lame ducks by the ships AA. Not one plane made it to deliver the bombs. At the end of the first night we played some more Chekc your six with Phil and had a great time. The next morning started off with a great battle at Cedar Creek. Unfortunately, I had the first unoit which was overrun while sleeping and my other unit did not come on until the very end. So it was a 5 hour viewing for me. After that things went great. Playing ALesia and the Battle of Bentonville was probably the highlight of the con for me. After those two great games we did an impromptu Ironclads game with Chris Rothermel. Had some fun players like Scott English, Ray “I shall charge and sink” Bishop attending. On Saturday, I had time for one quick game before heading home to the wife and kids and played a slightly different Ironclads game with Chris that was really fun. All in all had a great time and cannot wait for Historicon! Ladies and gentleman….it is time for Cold Wars! Last year’s Fall-In was my very first convention and I am extremely excited for Cold Wars. How fortunate am I to live with 2 hours of every major miniatures convention! Also, looking forward to hanging out with my peeps. A few of our group members are hosting games and I look forward to playing them again. I also have my wish list of Thoroughbred models that I will be purchasing. I must also prepare for my wife who will be yelling at me when I get home for spending too much money. Stop by and say “Hi”! As I started to get into the ACW Naval period I noticed that one common theme was that GM’s would need stats for a vessel and would many time find several contradicting pieces of information. What I was hoping to do was to collect all of that information and get down to the bare facts. After some time I realized this was quite a large project and could use some assistance. If you have a ‘favorite vessel’ please review what information we have, if any at this point. Please provide as much missing information as you would like. American Civil War Naval Registry (Can also access this from the ACW Naval button above. If we are missing a vessel please leave a comment in the navy area with information contained in this profile template. If we are missing or have incorrect information listed please place a comment for that vessel with the information and the source. Many of the Confederate listings do not contain the template as they were added before I thought to use a template but as time goes on I will edit the format for those. I would like to thank those in advance that wish to assist in this rather large project. Turned out to be a great day/weekend for painting. Got my blue primer and ocean blue paint and with Cold Wars on my mind I got to getting my table ready for many an ACW Naval battle! Also got the PBR pounders and cigars for Cold Wars! 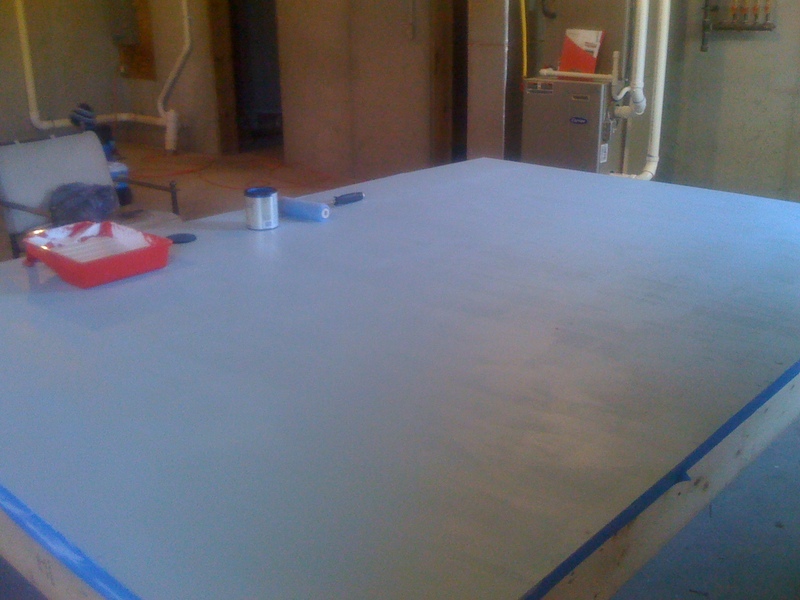 After the primer was applied. Will apply a second coat this evening. 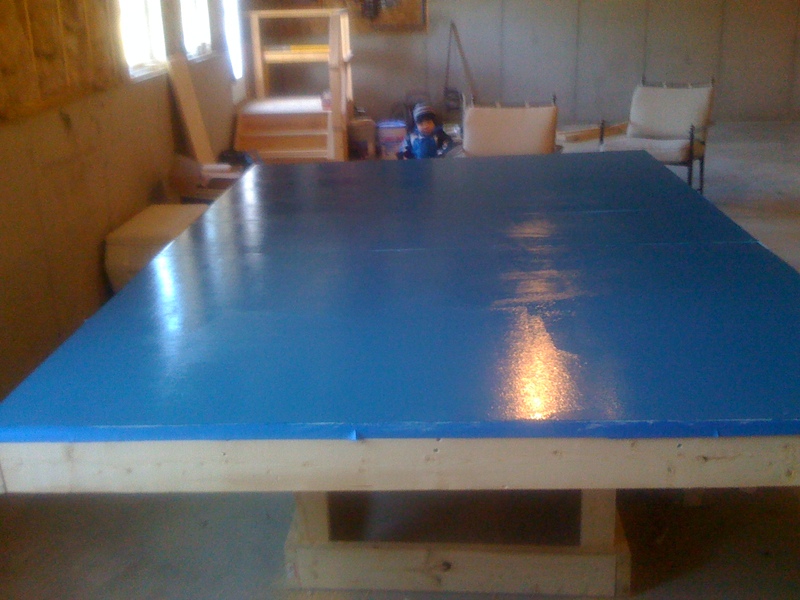 OK so I decided to paint my new gaming table blue in order to play naval. Then when I play a land battle we can just cover it with the green cloth. The lue may even be light enough to play aerial as well! So I went to Lowe’s for the THIRD time! The first two times I bought a blue I ended not being happy with. I went with “Azure Blue” and purchased a primer that has a blue tint to it. It is supposed to warm up this weekend so I am planning on painting it on Saturday. After the Cold Wars convention some friends and I will laquer the top to make a smooth surface and hopefully test it out with a game! My father-in-law and I built the table with 2×6’s and 2×4’s from Lowe’s that cost just under $180.00 in materials. 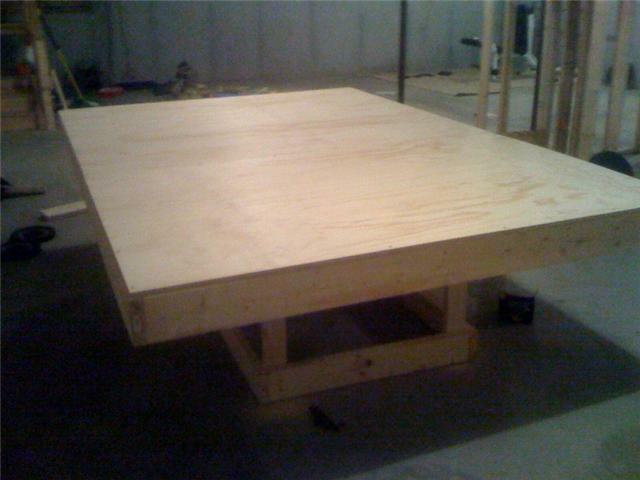 The majority of that was the tabletop which consists of 3 pieces of an extemely heavy and smooth plywood. Now the next step is to paint the tabletop blue. This is to allow naval battles and possibly air battles. This is covered with the green felt for land battles. The perfect table! Once painted Phil and I will be apply laquer for both protection and smoothness. So I decided to start a blog on WordPress. While I have my ‘Group’ on HMGS online, it is a new site and has limited functunality I decided to have a second blog on WordPress, a more established site with a lot of options. So what will you see here? Photos and commentary of battles foguht in the Carlisle Cavern of Carnage in addition to games played elsewhere. Of course in several years I may have my new foxhole buddies Sara and Dylan join me as well (hopefully!). So, here it to miniature wargaming and the great battles that lie ahead!